Kylie Minogue has confirmed the details for her upcoming promotional single. The Australian singer/songwriter christened the Sky Adams-produced “Dancing” as the first cut from her upcoming fourteenth album “Golden” and will release it on January 19 via iTunes and all other digital streaming outlets. “Golden,” which follows 2014’s “Kiss Me Once” and 2015’s “Kylie Christmas,” is scheduled to arrive later this year via BMG Rights Management. The highly-anticipated project reportedly boasts further productions from Richard “Biff” Stannard, Ash Howes, Cutfather, Peter Wallevik, Daniel Davidsen, Mark Taylor, Francis “Eg” White, Nathan Chapman, Luke Fitton, Chris DeStefano, Guy Chambers, Sigala, DJ Fresh, and Invisible Men. On the songwriting front, Minogue has worked with Karen Poole, Amy Wadge, Bonnie McKee, Eyelar Mirzazadeh, Lauren Aquilina, Grace Barker, Twinnie, Gina Kushka, Seton Daunt, Steve McEwan, Alex Smith, and Danny Shah. Stream the audio clip for “Can’t Beat the Feeling” below. Kylie Minogue has confirmed the title of her new album. The Australian singer/songwriter christened her fourteenth studio collection “Golden” and will release it later this year via BMG Rights Management. The follow-up to 2015’s “Kylie Christmas” reportedly boasts songwriting contributions from Karen Poole, Amy Wadge, Bonnie McKee, Eyelar Mirzazadeh, Lauren Aquilina, Grace Carter, Twinnie, Gina Kushka, Seton Daunt, Steve McEwan, Alex Smith, and Danny Shah. On the production front, Minogue has worked with Richard “Biff” Stannard, Ash Howes, Cutfather, Peter Wallevik, Daniel Davidsen, Mark Taylor, Francis “Eg” White, Sky Adams, Nathan Chapman, Luke Fitton, Chris DeStefano, Guy Chambers, Sigala, DJ Fresh, and Invisible Men. Stream the audio clip “Million Miles” below. Kylie Minogue has teamed up with Sky Adams for a new collaboration. The African German record producer and songwriter is known for his works with Zak Abel (“All I Ever Do is Say Goodbye”), Effie (“Pressure”), Rizzle Kicks (“Always Late”), Koda Kumi (“Hurricane”), Rochelle (“You Got Something”) and Yellow Claw & Yade Lauren (“Love and War”). Adams’ resume boasts additional alliances with fellow songwriters including Amy Wadge, Knightstarr, Maegan Cottone, Tebey Ottoh, Victoria Horn, Eyelar Mirzazadeh, Ali Tennant, Fiona Bevan, Tom Aspaul, Grace Tither, Danny Shah, Guy Chambers, Pam Sheyne, Ki Fitzgerald, and Gina Kushka. Minogue, on the other hand, is expected to release her fourteenth album and follow-up to 2015’s “Kylie Christmas” later this year via BMG Records. The still-untitled collection reportedly boasts further contributions from Nathan Chapman (Taylor Swift), Chris DeStefano (Kelly Clarkson), Steve McEwan (Carrie Underwood), Richard “Biff” Stannard (Sam Smith), Cutfather (Olly Murs), Luke Fitton (Tom Grennan), Guy Chambers (Marlon Roudette), Sigala (Craig David), DJ Fresh (Elle Eyre) and The Invisible Men (Rita Ora). Watch the music video for “Come Into My World” below. Fleur East has signed a record deal with Simon Cowell’s label Syco Music and will release her first studio collection later this year. The Sony Music Entertainment imprint is also home to artists including Little Mix, Olly Murs, Rebecca Ferguson, Tamera Foster, and Ella Henderson. East previously teamed with DJ Fresh on the track “Turn it Up,” taken from the British record producer’s 2012 album “Next Levelism.” That album peaked to number fourteen on the UK Albums Chart. Watch Fleur East’s performance of “Uptown Funk” below. DJ Fresh has premiered the music video for his new single online. The British electronic music producer posted the visual clip for “Gravity” to his official YouTube page on Wednesday (December 24, 2014). “Gravity” features vocals from singer/songwriter Ella Eyre, who previously teamed with other musicians including Rudimental (“Waiting All Night”), Sigma (“Changing”) and Naughty Boy (“Think About It”). The tracks follows the Ellie Goulding-assisted “Flashlight” and will be available for download from February 8, 2015 on Ministry of Sound Recordings. In related news, Eyre’s debut album “Feline” will hit stores and digital outlets on February 28, 2015 via Universal Music Group imprint Virgin EMI Records. The highly-anticipated project boasts productions and songwriting contributions from Chris Loco, Natalia Hajjara, Two Inch Punch, Wayne Hector, Starsmith, Jarrad “Jaz” Rogers, Steve Robson and Paddy Byrne. Watch the music video for “Gravity” below. DJ Fresh has debuted his new single online. The British record producer posted the audio clip for “Gravity” – featuring Ella Eyre – to his official SoundCloud page on Wednesday (November 13, 2014). “Gravity” follows the Ellie Goulding-featuring “Flashlight” and Little Nikki-assisted “Make U Bounce,” which peaked at number 7 on the UK Singles Chart. 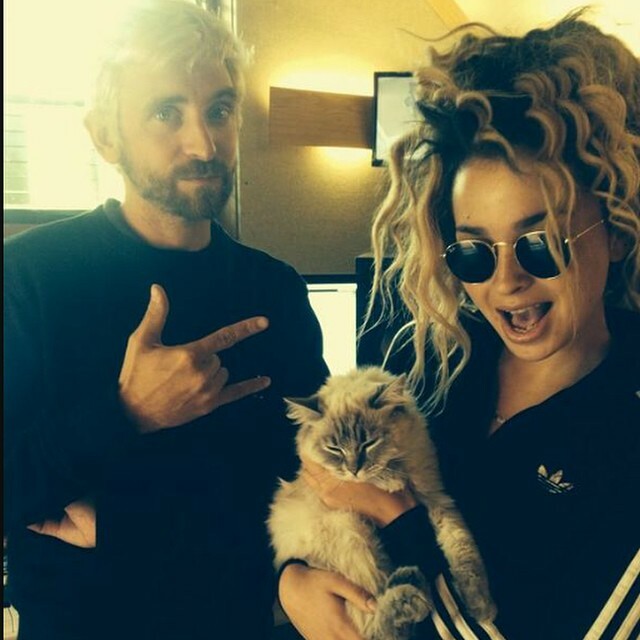 Meanwhile, Eyre is currently putting the final touches on her upcoming first studio album “Feline.” The highly-anticipated project is expected to be released in early 2015 via Universal Music Group / Virgin EMI Records. Her self-titled EP is now available for download via iTunes (US). The project boasts collaborations with Two Inch Punch (“Deeper”), Jarrad “Jaz” Rogers (“If I Go”), Ilya KnocDown (“Comeback”) and Paddy Byrne (“Home”). Rita Ora has recruited Tommy Brown for her upcoming sophomore album. The songwriter and record producer – born Thomas Brown – previously collaborated with artists including Nas [Def Jam Recordings], Jennifer Lopez [Capitol Records] and CeeLo Green [Elektra Records]. Some of his notable credits include Christette Michele’s “Visual Love” [Motown Records] Ariana Grande’s “Honeymoon Avenue” [Republic Records] and Kanye West’s “Sin City” [Roc-A-Fella Records]. Meanwhile, Ora’s new LP is scheduled for release later this year via Sony Music Entertainment / Roc Nation / Columbia Records. The Calvin Harris-penned and produced lead single “I Will Never Let You Down” debuted at number one on the UK Singles Chart. Among the other musicians backing Ora on the highly-anticipated project are DJ Fresh (Ellie Goulding, Nicola Roberts), will.i.am (Leah McFall, Britney Spears), DJ Mustard (Rihanna, Charli XCX) and Diplo (Usher, Chris Brown). Watch the music video for “I Will Never Let You Down” below.